Mix the cream cheese and honey together and spread evenly over each tortilla wrap. Spread one teaspoon of jam over each tortilla wrap. Roll tortilla wrap from side to the other and place seam side down on a nonstick baking sheet. Bake for 15 minutes until wrap begins to brown. Remove from oven and cut each wrap in half. Arrange on a plate and serve with the yogurt dipping sauce. 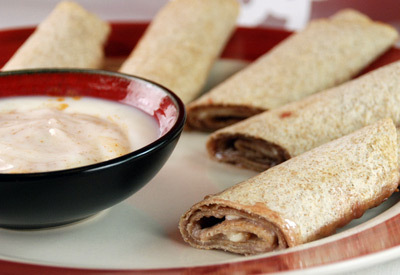 Stir together yogurt, milk and cinnamon and serve with warm Fruity Jam wraps.